If Consumers Want to Know Where Their Tomatoes Are Grown, Don’t They Have A Right To Know Where Their Lawyer Is Located? Yesterday, while shopping in WholeFoods (a reward to myself after a particularly grueling week consisting largely of take-out), I noticed several prominently displayed signs touting local produce. 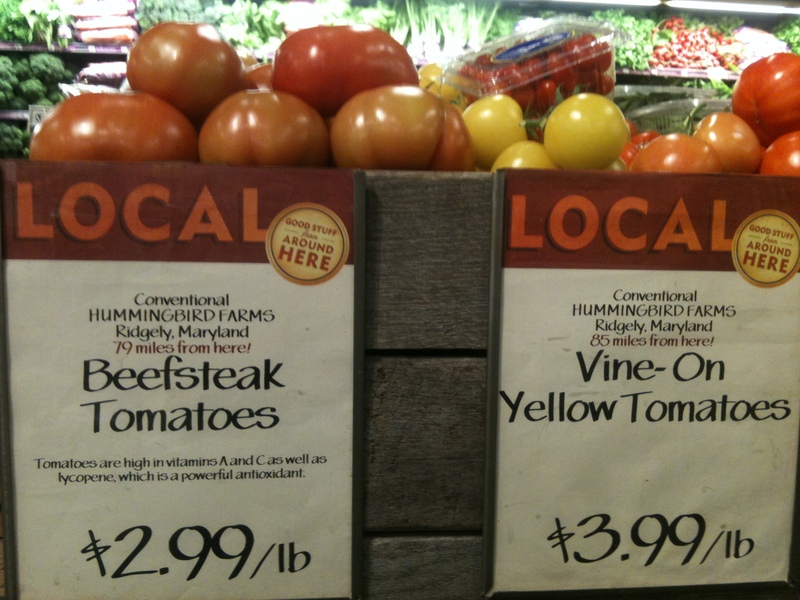 Though the Whole Foods stores in my area have carried local produce for some time, what made this display particularly interesting is that the sign disclosed both the name of the farm where the produce (in this case, tomatoes) were grown and its distance from the store (as an aside, I’m not sure why the sign offers two different distances, but they’re close enough). So I got to thinking, if the source of consumers’ tomatoes is important enough for Whole Foods to identify on a sign, isn’t the location of one’s lawyer equally important? Though I support the concept of virtual law firms – among other things, they expand affordable access to law, enable lawyers to compete with online services like Legal Zoom and allow for increased work-life balance– I’m also troubled by those lawyers who hold themselves out as a virtual or “online only” firm to deceive or conceal information from clients. For example, I’ve seen virtual or online law firms where the lawyer appears (say from Facebook or Twitter) to be physically located in State A (where the lawyer isn’t licensed) who target clients in State B (where the lawyer is licensed) — but who neglect to mention prominently on their website that they’re not physically located in State B. Or lawyers who merely state that they practice in California or New York, without providing an address indicating which part of the state where they practice. So, what’s the problem, legal futurists ask. After all, law if fungible – and if Legal Zoom can deliver legal services from any location, why can’t lawyers do the same as well? And if consumers are purchasing legal services online, why would they care where the lawyer is physically located? Truth be told, some clients do care. Even those clients who choose delivery of legal services online may be uncomfortable to learn that their lawyer isn’t located where they believe him or her to be. Take my own situation, as an example. Here in DC, I serve clients all over the United States and the world – and I rarely meet or interact with them in person. Much of what I do for my clients in DC can be transacted online – I rarely make a physical trip to FERC or the courts where I practice to drop off or obtain documents. But some of my clients believe that I do, while others like to know that there’s a theoretical possibility for me to do so. In short, they want me in Washington D.C.
Now, Washington D.C. is a bar with easy reciprocity. It wouldn’t be hard for lawyers in Idaho or Nebraska or Maine to gain admission and hold themselves out as FERC practitioners without mentioning that they’re not located in Washington D.C. And to me, that’s unfair. Moreover, because many clients may not specifically ask about location, or may assume the firm is located in DC, it gives those firms a competitive advantage because they can undercut my pricing. I think location matters more than many folks let on. For those of you who have used virtual services, does it really not matter at all where the lawyer is physically located? Personally, if a New York licensed lawyer drafts an incorporation for me out of a home office in India, it wouldn’t bother me per se – so long as I know where the lawyer is located. If a lawyer didn’t disclose that information, I’d wonder what else he or she was holding back. Of course, at the end of the day, the locational issue really isn’t about what lawyers want, but what clients deserve. Clients have an unfettered right to the attorney of their choosing, and have the right to choose an attorney for any reason. As most lawyers know, a client’s decision to hire a particular attorney is as much based on visceral considerations – the tone of voice or firmness of handshake – as skills and credentials. As much as we’d like to, we can’t deny that location is one of those visceral considerations. Many clients who hire a lawyer to handle a New York matter want to know that the lawyer is physically located in New York, that the lawyer has physical access to courts and other lawyers to ask questions and that the client, if needed, can drop by the lawyer’s office. This is true, I believe, even where the lawyer is virtual. Thus, when a client hires a lawyer who is licensed in New York, but fails to mention that his physical location is in Alaska – or even India – a client would be justifiably upset. I certainly would be. For that reason, all law firms, and virtual firms no exception, must be fully transparent about their physical location. Specifically, they should be required to disclose — prominently — on their websites where they’re located. I don’t think it has to be the actual physical location -for instance if a lawyer works from home, but has a local PO Box in the vicinity, that would suffice for purposes of disclosure. Clients deserve this information to make a fully informed decision about the lawyer they’re going to hire — and it’s deceptive for a lawyers to lead clients to believe that they practice in a particular location when they don’t. After all, if location matters for tomatoes, shouldn’t it matter for lawyers?